Oops!! Where has the month of February gone? 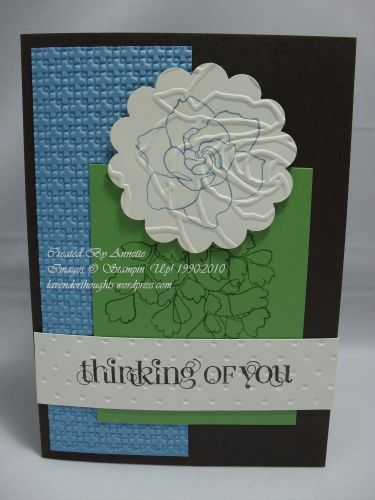 I have been doing lots of card making, but somehow forgot to get the creations uploaded for you to see. You will have to wait a while now as my posts over the next few days will showcase what I made at the Mad Inkstincts Team Retreat which I attended last weekend. It was a wonderful time to meet up with many wonderful ladies in Madonna’s team and share ideas. Here are some of the creations we made….. I think we needed a bigger showcase table. My first one is the main challenge that Madonna set. 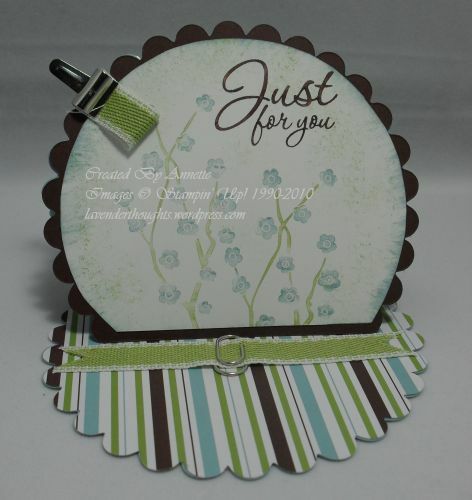 She provided Baja Breeze, Chocolate Chip and Whisper White cardstock as well as Nursery Suite Speciality DSP, Pear Pizzazz Stitched-Poly Ribbon and a couple of hardware pieces from the Clips Assortment. We then had to come up with our own creation. 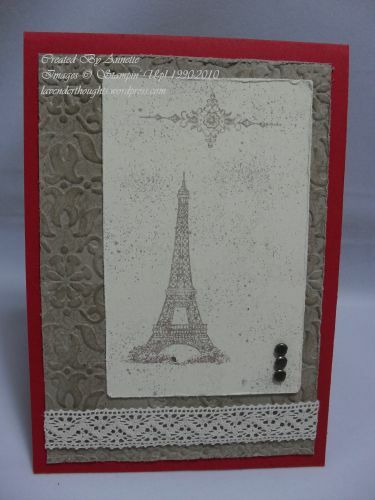 Using some stamp sets and dies on the table, I came up with this Scallop Circle Easel Card. The second challenge I attempted was a sketch challenge. I don’t have a picture of the sketch, but I did stick fairly closely to it. The only change I made was to use a scallop circle instead of a plain circle. The third main challenge was to use our least favourite style and colour combination. As you would know from my creations, I much prefer the clean and simple [CAS] look. So, for this challenge I tried to go vintage. I am not a huge fan of Crumb Cake, so I used it together with Riding Hood Red and Confetti Cream. I think it still ended up a little CAS, but I did distress the edges, use a stamp set that I probably would not think of using normally and added some lace [thanks Mercia]. I must admit, I am very happy with the result. I still need to add a sentiment, but will do that when I decide who will receive it. I will keep adding more of my retreat creations over the coming days. 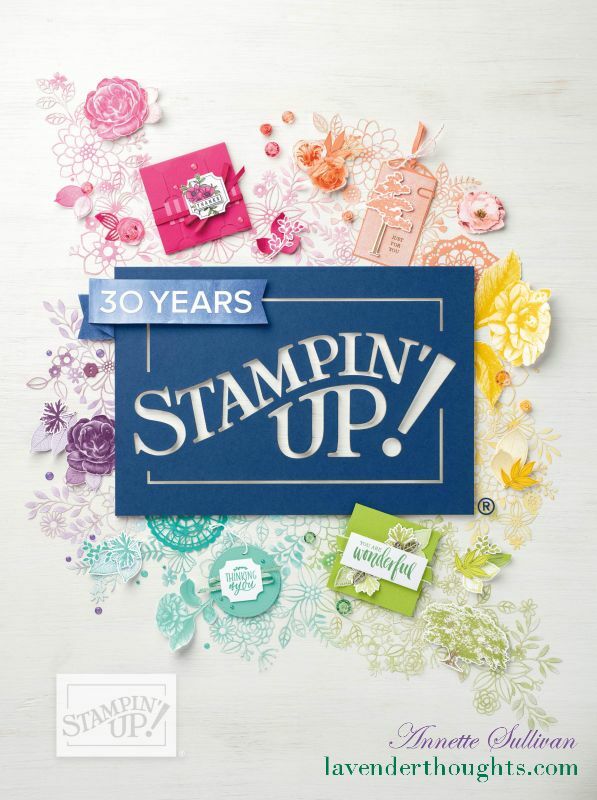 Thanks for sharing a great weekend and giving us girls lots of fabulous new ideas to take home. 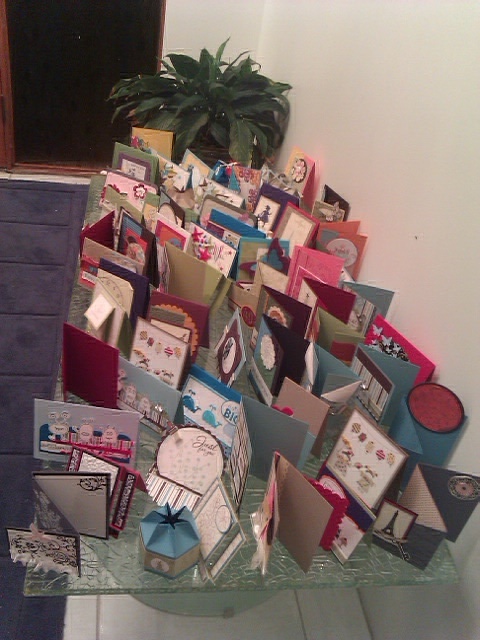 Loved all of your cards they were even better IRL.